The month of June is typically the time when the celebration of student success takes place with graduations at all levels. It’s beautiful to see students be inspired to find a solution or solutions to a problem. One recent recognition of student success occurred on Saturday, June 6th at the California State University Northridge campus where over 150 elementary, middle and high school students gathered with their families, teachers, and an extended community of supporters, volunteers and partners – Resource Area For Teaching (RAFT), Time Warner Cable, and Mouse Squad. The students are graduates of a new Youth Policy Institute (YPI) yearlong Science, Technology Engineering, and Math (STEM) expanded learning, afterschool program of Project Based Learning for the entire 2014-2015 school year. 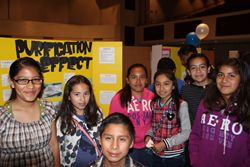 Students of Los Angeles Unified School District schools participating in this YPI STEM program had the opportunity to experience and develop a deeper understanding of STEM topics with design challenge projects in which they worked in small teams to come up with solutions to real world problems. RAFT’s close collaboration with YPI led to the co-creation of the required resources needed to execute the multilayered program. RAFT’s STEM-based Design Challenge: “Transporting Fresh Water!”, required students to develop creative solutions to transport fresh water from one village to another separated by a large distance --a desert, a dangerous jungle, or a large ocean. With California’s very real current state-wide drought in mind, the students worked in teams and used provided materials to build a scale model of different devices to test out the engineering design process. Many of these materials include items like paper bags, cardboard tubes, plastic pipe tubes, file folders, an blue medical shoe covers – industrial and commercial discards, overruns, and restocks --donated to RAFT for classroom learning. Using affordable, everyday materials gives students the freedom to be creative and to explore many different ideas. Before initiating the design for a proposed solution, students were presented with the project parameters, questions for reflection, techniques in brainstorming ideas, and the principles of the Engineering Design Process to evaluate their designs. An example of student work includes a functional model of a device intended to aid local residents in determining when their household water usage has reached a critical point. The device included an electrical circuit with a light bulb activated by the weight of beads and other objects that represent various decisions on how water is used (garden, brushing teeth, etc.). The project also explores desalination as a method of increasing the amount of available water in California. The student teams, who were able to choose from a number of different projects, presented their work at the YPI STEM Challenge Showcase on June 6th to judges from RAFT, Youth Policy Institute, and a volunteer who studied and works in the field of electrical engineering. Each project was scored based on: evidence of learning, science or engineering, presentation, skills and clarity. After scores were tallied by the judges, Fidel Ramirez, YPI Director of Youth Services and Nancy Arias-Curiel, YPI Youth Services Curriculum and Evaluation Coordinator, presented students in both high school and middle school categories with awards and certifications to acknowledge their efforts and achievements. Several more participating teams received Honorable Mention awards. “It’s beautiful to see students be inspired to find a solution or solutions to a problem. They see the world through a different lens when exposed to such projects and encourages them to ask questions, look at challenges as opportunities to make this world a self–efficient and better place, and it allows them to be intrinsically motivated to take control of their own learning,“ said Eddie Torres, YPI Assistant Director of Youth Services. RAFT believes the best way to spark the love of learning for the next generation of thinkers, innovators, problem-solvers, and creators, is through hands-on learning. A nonprofit organization since 1994, RAFT serves 12,000 educators each year who teach over 900,000 students. Find out more about RAFT and how to get involved at http://www.raft.net. The Youth Policy Institute (YPI) transforms Los Angeles neighborhoods by ensuring access to high quality schools and wrap-around education and family services, enabling a successful transition from cradle-to-college-and-career. It is the lead agency for the Los Angels Promise Neighborhood initiative. YPI serves families through 125 program sites that offer place-based education and training services via afterschool programs, charter, pilot, and partnership schools, job training, summer jobs for youth, physical education, adult education, technology, case management, parenting, tutoring, and college preparation. Each year, YPI programs serve more than 100,000 youth and adults in Los Angeles. For more information, visit http://www.ypiusa.org.